This link may have updated Farmer's Market info. It's also listed by city, rather than by island. 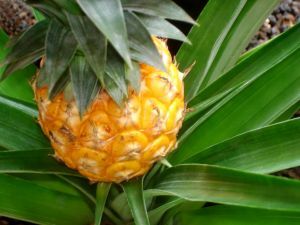 One of the best things about being in Hawaii is the amazing abundance of fresh fruits and vegetables. With the year-round growing season and perfect balance of sunshine and afternoon showers, Hawaii is a farmer’s paradise. It’s no surprise, then, that wherever you are, you can find a Farmer’s Market nearby just about every day. You can find the basic tropical fruits (papayas, pineapples, bananas, citrus) as well as the seasonal exotics (mangosteen, durian, cherimoya, custard apple, chiku and fruits of every shape, size, flavor and color!) For a dollar or two, it’s definitely worth trying something new! How many people can say they’ve eaten a rambutan? Go for it! The diversity of vegetables will also surprise you. You’ll probably find the standards (lettuce, tomatoes, peppers, onions, etc.) and you’re likely to find an array of vegetables you might have never thought existed (fiddlehead ferns, Japanese eggplant, Hawaiian chilies, and much more). Ask the vendors how they’re prepared, and you might get a glimpse into Philipino, Japanese, or Portuguese culture that only comes from preparing their food. Some markets will even have locally grown eggs, dairy, honey, and even crafts. Many of the vendors will display their Organic certifications. Frequent these vendors when possible. Organic farming (without the use of pesticides, hormones and fertilizers) is best for the island, and is best for your health. 1. Get there early. At many markets, when they ring the bell, the pace is fast! 2. Bring your own grocery bags. A cloth bag is great. Also, if you have a mound of plastic grocery bags at your house, the farmers are always happy to take them and reuse them. 3. Bring cash. Vendors won’t take checks. 4. If you’re going to be driving around after you hit the market, you might want to put your fruits and veggies in a cooler in the trunk until you get home. 5. Drink a coconut while you’re there. For $1-3, you can rehydrate and enjoy a truly tropical treat! Tuesday & Friday, 7:00 a.m.-4:00 p.m.
Monday, 10: 15 a.m.-11:00 a.m.